5 Minutes with Interior Designer Melissa Welsh. Catch up #2! Today we met up with Melissa Welsh, creative stylist and designer behind Melissa Welsh Style and Design, to follow on from our first article, and find a greater insight on interior design. Melissa, in our last chat, we spoke about how to create a grand feel in a small space. What about the opposite? What do we do when we have a large space we need to furnish without that sparse look? When designing a space, furniture should always be considered in the design and concept stage of the process. By doing this you avoid the potential issue of furniture that is out of scale for the size of the space (too big or too small). 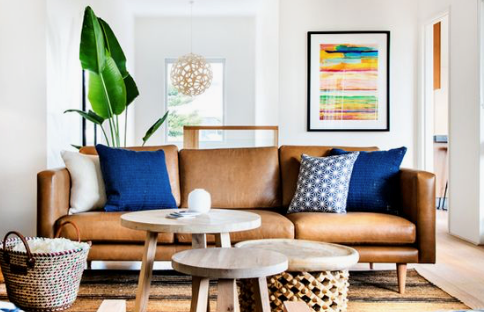 If you have found yourself with a large living room but want to create a stylish and comfortable space, then think about designating areas within the room for certain functions, such as watching TV/relaxing, dining and study. The area can then be divided up using large area rugs, bookcases, shelving, console tables to define or divide the space. With a small 2-seater sofa, using a large floor rug will anchor the space and make it look visually appealing. Combining with the sofa, 2 occasional chairs which can then be moved around the room. Using large art works or groups of art prints is also a way of pulling the space together. Consider using art work as a focal point to anchor the room, much like a large floor rug. Good idea! Creating a multi-functional space will not only look great, it is also super practical for everyone! What about colours? Where do we even start? This comes back too really having a vision for the home of what it will look like once it is completed and also considering the natural environment in which your home sits. If you are struggling with your vision and don’t feel alone here a lot of people do (that is why interior designers and stylists are hired) then use a platform like Pinterest to find images of homes and spaces that you love, hopefully you will start to see a common theme with the images you pin, this can then form the basis of selecting a colour palette for your home. With a vision in mind you can start to think about the colour palette. When starting the colour selection process, start with the largest area of colour that you will see in your home and work from there up. The floor colour and material is usually largest area of colour your eye will see followed by the walls and ceilings. 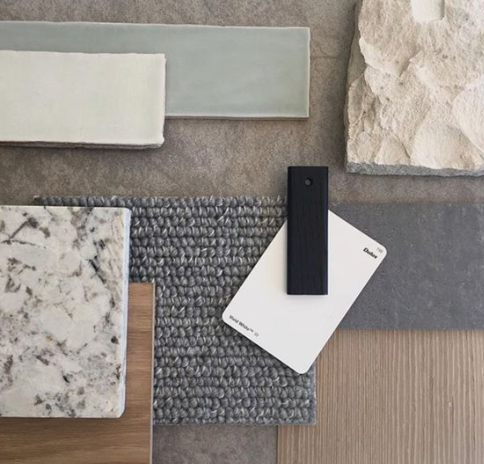 For example, if you are wanting to create a contemporary modern feel in your home you may consider using grey or charcoal vinyl plank flooring or if you are creating a coastal home then light-coloured whitewashed timber floors would be a good starting point for the colour palette. Once the floor material and colour has been selected then use this to co-ordinate all other finishes (paint, tiles, cabinetry etc. ), making sure they work together. Thanks Melissa! Great starting points and tips to get us started on our home designing journey. We regularly hear our clients discussing creating a really luxurious home, but without hitting the hip-pocket too much. Any ideas around this? This can be done using a simplified colour palette, using no more than 3 colours and one of those colours should be contrasting but complementary. Using metals such a gold and brass fittings for bathrooms and kitchens will add a nod to a little luxury. Add in texture using fabrics that are luxurious to the touch, linens, velvets, deep pile floor rugs. When dressing a bed, using 4 pillows (2 standard and 2 European), cushions and throws will make your room look and feel like a high-end hotel room. Using well selected art prints as the focal point and then curating your soft furnishings (cushions, throws, ottomans) to work back with the colours of art work. The room will then look pulled together effortlessly. Less is more, don’t clutter rooms with stuff. A couch only requires 2-4 cushions, opting for quality rather than quantity. Fresh flowers and foliage are always a must for creating that something special about a home. You don’t have to spend a fortune, simply forage in your garden or local neighborhood. Foliage like olive branches work really well on mass in a beautiful vase. 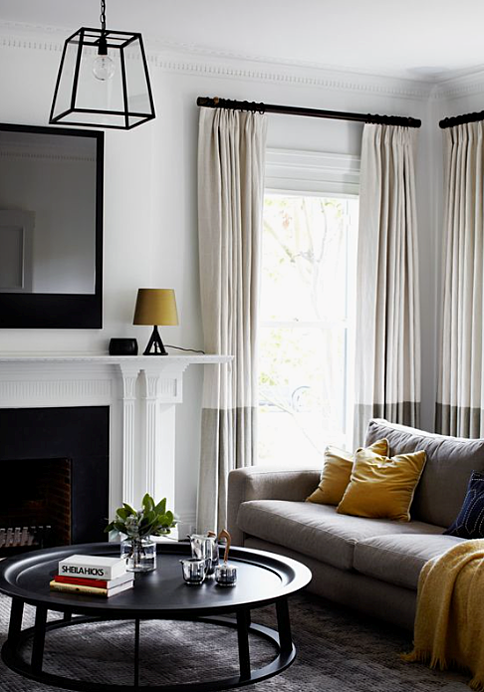 The space above has a limited colour palette of grey, black and mustard for a luxurious feel and paired back feel. Thank you so much Melissa for the advice. Your passion is so clear to see! If you want to learn more about Melissa Welsh Style & Design or book a consult, visit https://www.mwstyleanddesign.com.au/ or call 0427 455 775.